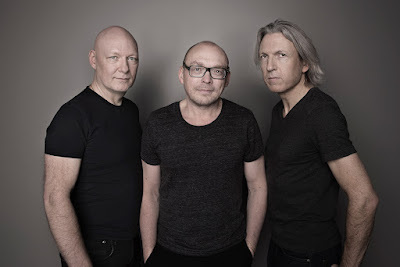 The new band Rymden, comprising drummer Magnus Öström, bassist Dan Berglund and keyboard player Bugge Wesseltoft, has been called a jazz ‘supergroup’ – to co-opt a term from prog-rock. Yet you could say that every other great jazz line-up is a supergroup, a coming-together of musicians who made their reputations in other bands. Think of the Modern Jazz Quartet or Weather Report, the best known Blue Note albums or the trio of stars that made Money Jungle. Rymden combines two complementary strands of Nordic jazz. Wesseltoft, whose New Conception of Jazz shook up European jazz in the 1990s, presides over grand piano, synthesizer and Rhodes piano with wit and élan: he has an energetic, cliché-free command of all three instruments. Öström and Berglund were two-thirds of e.s.t. the groundbreaking band that transformed the piano trio landscape more than two decades ago, but came to a tragic, unanticipated end after the sudden death of pianist Esbjörn Svensson. Wesseltoft sounded best on the sections featuring Rhodes piano, which he plays like a demon, occasionally using drumsticks on the open top. There were fluid, funky moments that put me in mind of Crossings-era Herbie Hancock with a Nordic twist. Öström’s drum sound has a warmth that complements the machine-like intensity of his more complex drum parts; Berglund’s bass is supple and authoritative, switching comfortably between earthy pizzicato and emotional arco. The Norwegian-Swedish chemistry between Öström, Berglund and Wesseltoft is starting to work, but I suspect we’ll hear better gigs in the future. For a six-minute taste of what they do, you can listen to The Odyssey, the opening tune in Thursday’s concert, via Spotify.